Donations to the Department of Education’s official charity are down more than 50 percent on Mayor de Blasio’s watch — and recently generated the smallest grant to city schools in more than a decade, The Post has learned. The steady drop in annual contributions to the Fund for Public Schools — from $31.4 million to $15.4 million — followed a record $47.7 million collected during the last year it was solely controlled by the administration of Mayor Mike Bloomberg. 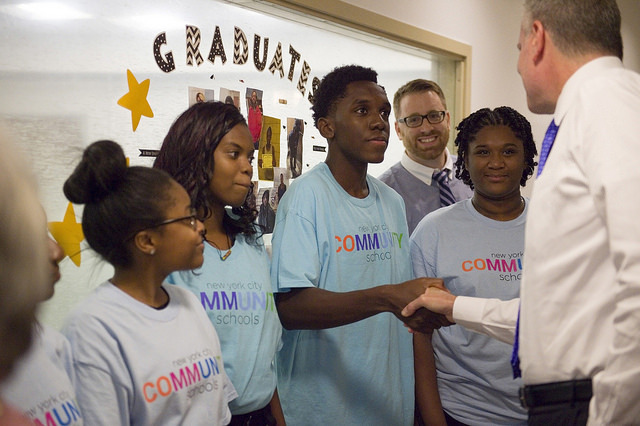 The fund has in the past been used to help train principals and open small, specialized high schools, and currently funds programs including de Blasio’s signature pre-K initiative. But with revenues on the decline, the fund recently hiked annual spending on wages and salaries by 16 percent, according to its most recent filing with the Internal Revenue Service. Records show those expenditures included $141,259 paid to an executive director who later quit and has yet to be replaced — leaving the post vacant since November. The nonprofit has also reported deficits on every return filed following de Blasio’s first election as mayor, with the most recent exceeding $4.4 million. And in another sign of mismanagement, the fund actually lost $76,828 on $15.3 million in total revenue between July 1, 2016, and June 30, 2017. During that same time, the S&P 500 Index surged 15.2 percent, the Dow Jones industrial average soared 18.9 percent and the Nasdaq skyrocketed 26.3 percent. The director of a charitable foundation that stopped contributing after de Blasio took office said the decision was based on the mayor’s reversal of several of his predecessor’s policies. They include de Blasio’s fierce opposition to charter schools, as well as his scrapping of initiatives that let principals hire teachers and assigned letter grades to reflect the quality of individual schools. “Fundamentally, the mayor has been against every education reform that has improved the lives of underserved kids in New York City,” said the director, who spoke on condition of anonymity. The nonprofit official also tied the overall drop-off in donations to de Blasio’s progressive politics. “Some in the philanthropic world think he believes it’s dominated by the 1-percenters, whom he blames for the world’s social problems,” the director said. De Blasio’s first schools chancellor, Carmen Fariña, rejected about half of a $3 million grant to the fund from the Carnegie Corporation of New York rather than open a new, small high school for which the cash was earmarked, The New York Times reported in 2015. The fund — which exists to support public education with money from philanthropic foundations and other donors — was established in 1982 and is chaired by the city’s schools chancellor. Under Bloomberg, a billionaire supporter of education-reform efforts, the fund grew into a fund-raising powerhouse, raking in $400 million during his three terms. During fiscal 2012, which ended six months before de Blasio took office, it spent $34.6 million on the DOE and reported a $12.2 million surplus. But grants to the DOE have fallen steadily under de Blasio, from $31.6 million in fiscal 2013 to $17.7 million in fiscal 2016 — the lowest since fiscal 2005. That amount comprised $17.4 million in cash and $254,734 worth of “athletic clothing,” records show. In addition to a pair of pre-K programs focused on math and the arts, the fund’s Web site touts its fund-raising for Computer Science for All, a 10-year, $81 million initiative to boost tech education across all grades. The fund is also administering the New York Community Trust’s Reading Rescue program, which aims to improve literacy among third-graders, among whom a dismal 41 percent are proficient in English, the site says. The fund also churned through two executive directors since de Blasio’s election. The first, Iris Chen, lasted a mere 16 months before quitting abruptly in late 2015 amid low office morale and high staff turnover, according to reports at the time. She was replaced by Sarah Geisenheimer, who left after 20 months to become chief operating officer of the education-related charity 100Kin10 in November. A DOE spokesman said Schools Chancellor Richard Carranza “is actively searching for a new executive director for the fund,” and that “Deputy Executive Director Julianne Rana has proven to be a strong and effective leader” in the interim. Posted in Education Budget, Funding For Education and tagged "Standing Strong for Public Education", #iBelieve, Accountability System, Advocacy, Education, Every Student Succeeds Act (ESSA), Federal Education Policy, High-Needs Students, NEAExecutiveCommittee, Public Education, State Budget, Students. Bookmark the permalink.